Searching for and comparing flights used to be a massive pain in the neck, even just a few years ago. You’d either have to check each airline’s website individually, or go through one of the many online travel agencies (OTAs) that often showed different prices. Of course, this was the easiest it had ever been…before the internet became what it is today. Back then, your only choices were to call the airlines or go into a travel agent’s office! Things got a lot better in 2011 when Google Flights launched following Google’s purchase of ITA Software, a travel and reservations software company. In the few years since, a stream of improvements and innovations has brought the program leaps and bounds ahead, making it the single most useful tool for both deal-seeking travelers and those looking for luxury. 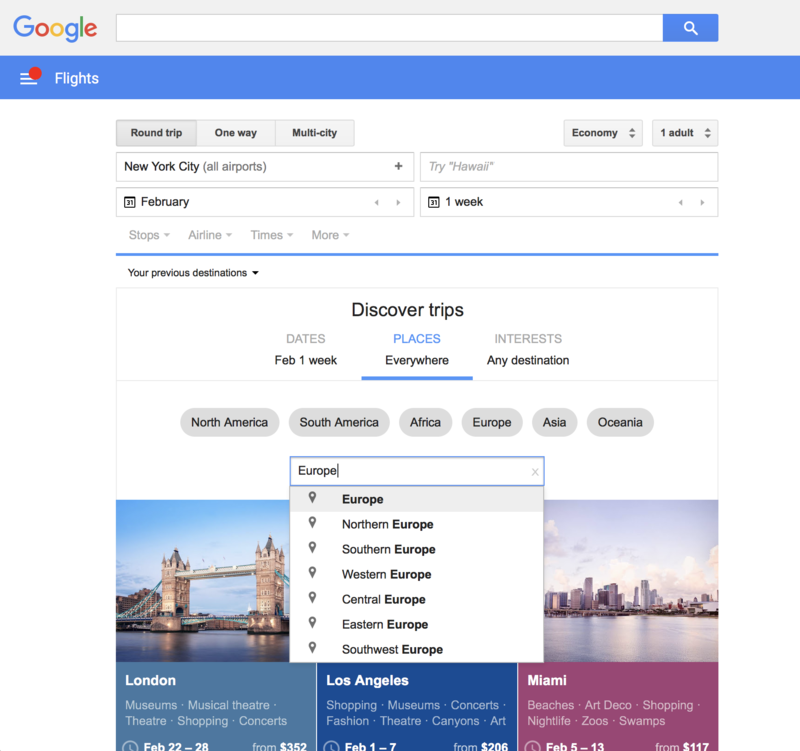 But what makes Google Flights different? What makes it worth your time? 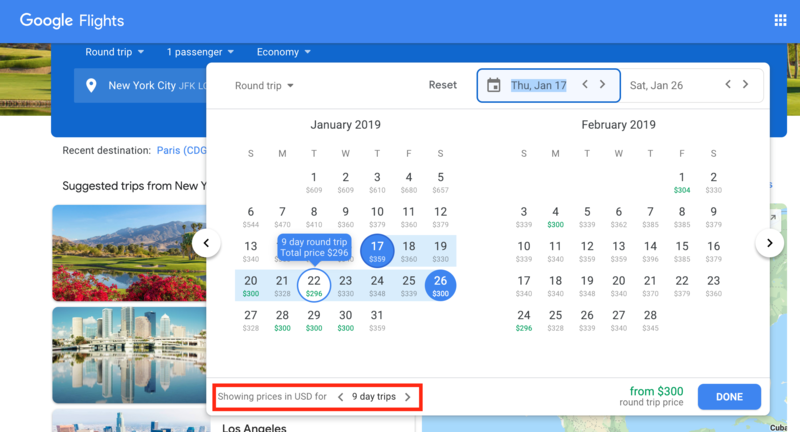 Let’s go over the key features that make Google Flights a great option the next time you are searching for a deal on a flight. The first thing you might notice is that Google Flights isn’t quite as flashy as some of the online travel agencies like Expedia, Priceline, or Orbitz. Have no fear — it’s still a powerful search engine with lots of options! Of course you start by entering your basic search criteria, just as you would on any other site. But with Google Flights you can do more. You can enter up to 7 departure and 7 destinations in the search box! This allows you to do multiple searches at once, which can save you tons of time when you are doing a flexible search. For example, let’s say you live in New York City and want to travel to Europe, but you don’t have a specific city in mind. Image courtesy of Google Flights. In the departure box you can enter New York City, which will automatically search all of the New York Airports (LGA, JFK, EWR) — or you can select the airports individually, including other nearby airports like Islip, Long Island (ISP) or Philadelphia (PHL). For your destination city, start typing in any cities you might be interested in visiting like Paris (CDG), London (LGW, LHR), Brussels (BRU), etc. Now you can search for the best option all at once, instead of looking up the price of each route individually! Your results list will display options including all of the cities you added to your search. In my case, I could see the cheapest flight from Newark to Paris (EWR-CDG), but with a layover. For an extra $19, I could get a direct flight from Newark to London (EWR-LHR). 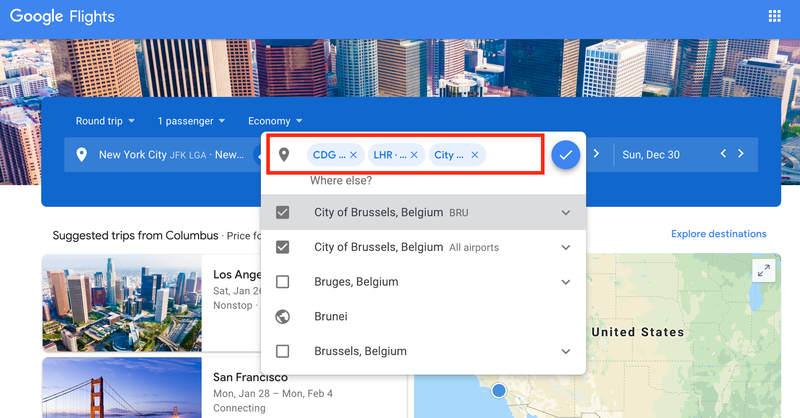 Bottom Line: If you have some flexibility in your travel plans or don’t know exactly where you want to go, Google Flights can save tons of time by combining multiple searches into one. 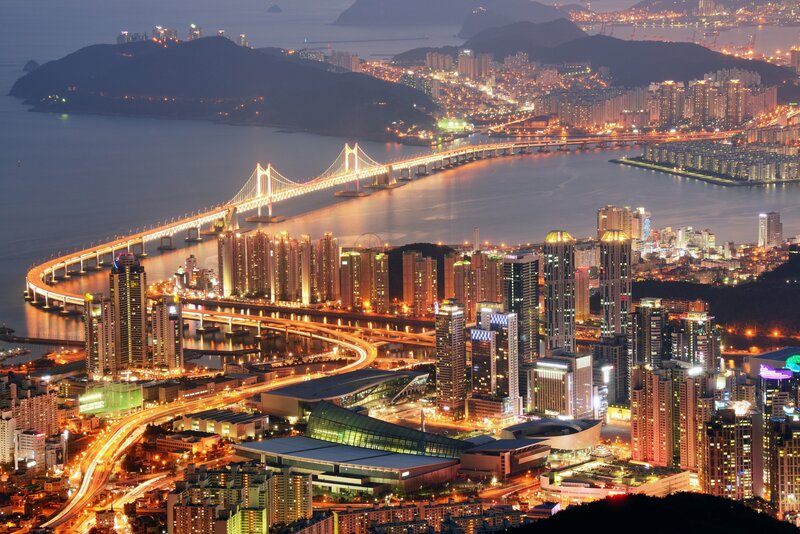 You can input up to 7 departure cities and 7 destination cities all in one search to see what the cheapest option will be quickly and easily! Now you know you can search multiple departure and arrival cities — but what about dates. How can you find out the cheapest dates to fly? After inputting your departure and arrival cities, look at the dates to the right side of the search box. If you click the calendar icon, you’ll get a calendar view showing you prices for the whole month. Days that offer lower prices will be shown in green. Here you can see that by shifting my trip 5 days ahead, I can save $63. Hot Tip: You can adjust the duration of your trip by using the arrows at the bottom of the calendar box. 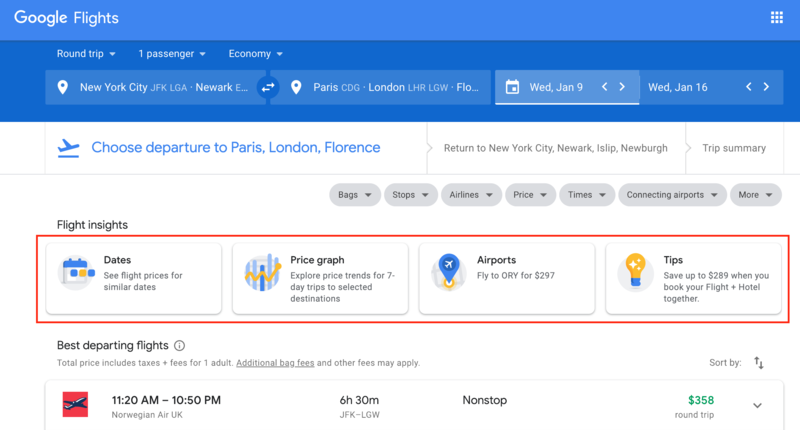 If you would like to know what the prices are for your search on different dates after you’ve already started a search, click on Dates in the Flight Insights section right above your search results. No matter how you start your flight search, you will see a graphic for Flight Insights above your search results. This is where Google Flights is showing you how to save money. There are 4 different boxes you can click for more information. When you click on the Dates box, a price graph will show up listing prices for different date combos. Any price lower than your current search will be listed in green, and prices that are significantly higher will be in red. You can adjust the dates using the toggle buttons at the top and right side of the graph. But be careful — I found that when I changed the dates, the highlighted prices went a little haywire. Some were showing up in green but weren’t actually lower prices! Hot Tip: Use the color indicators as guides, but pay attention to the actual price listed too. The price graph shows you 2 months worth of prices in a visual graph form. You will easily be able to see price trends and how your specific dates fit in. You can scroll further in the future with the arrow to the right of the graph. Change the duration of your trip using the plus/minus buttons by your selected dates. This tab shows you any other airports that are near your origin or destination airport (you can toggle between origin and destination airport at the top of this section). You will be able to view their locations on the map and get details including flight prices to the left of the screen. Click on any airport to see the distance from city center. Here you can view vacation packages as well as destination guides, maps, and videos. If you plan to book a hotel as well, it might be worth a look at the Flight + Hotel packages. These types of packages can often save you money, but it’s always a good idea to price out everything separately to make sure the package is worth it. Although this tool lets you search for, compare, and purchase flights, it’s not technically an online travel agency like Orbitz or Priceline. Rather, it’s a highly effective metasearch engine that saves you the step of searching each airline and website individually. So, while you will use Google Flights to search for the best flight, you won’t book through Google Flights. Hot Tip: Google Flights finds fares and then directs you to the airline’s website or an OTA, so we like to use a card that earns bonus points on travel purchases. For example, the Chase Sapphire Preferred® Card earns you 2 points for every $1 that you spend with the card on travel or dining purchases. If you’re a business owner, we’d strongly recommend using a rewarding business credit card when making a travel purchase. Scroll through the results and click on one that interests you. Some itineraries show just 1 flight option, but others may say something like “4 similar flights.” This means that the airline/alliance shown has a few different flights available for a similar price and the same number of stops. When you click the result, you’re prompted to choose your actual outbound flight (if there are similar flights). If there’s only 1 choice on that result, you’ll be prompted to pick your return flight. Keep in mind that the price shown on the initial results screen is the lowest possible price for that itinerary. This means that depending on which return flight you pick, it could be more expensive. This isn’t really an issue; just make sure to pay attention to the prices of each return flight. When you’ve chosen your flights, Google offers a few options for booking — generally, these are the cheapest options it can find. Usually, the first (and cheapest) option is to book directly with the airline operating the flight, but sometimes Google gives you the option to book through the airline’s partners or whichever online travel agencies offer the best deals. Click the price button next to your chosen booking method; you’ll be redirected to that website to make your reservation. The travel details are already set, so all you need to do is confirm them, enter your personal information, and pay. Bottom Line: While the other features that Google Flights offers are definitely useful, its basic flight search functionality is the heart and soul of this tool. It’s not quite perfect and doesn’t have full access to every airline — specifically, it can’t access prices for Southwest Airlines — but otherwise, it’s the best way there is to search for flights. 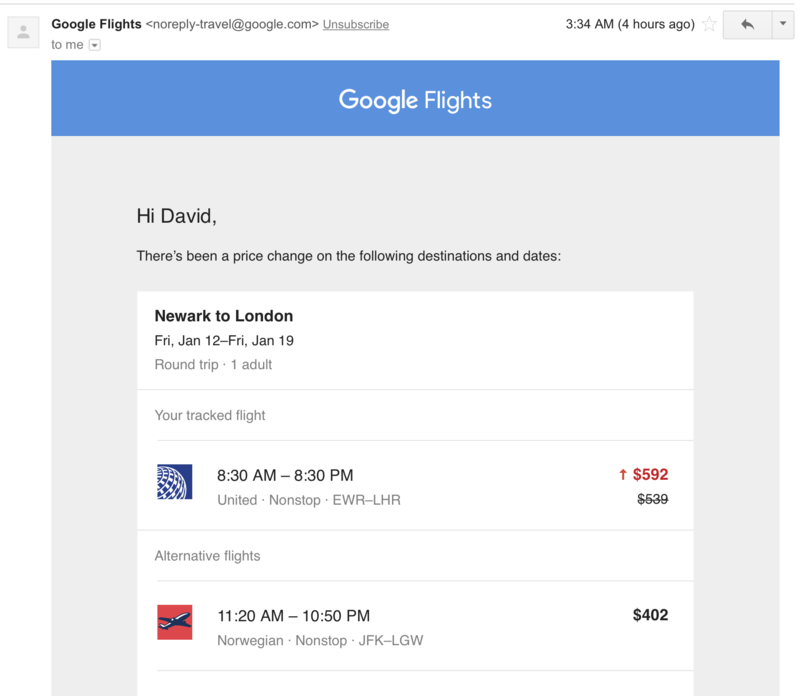 Google has a tool that lets you track flight prices. You can set an alert, and Google will send you an email if prices go up or down. To set an alert, look under the booking sites after you’ve chosen an itinerary, and click the price tracker button (take a look at the screenshot of results above). If you’re logged into Google, the alerts will be sent to your Gmail. Otherwise, enter an email address. Once you turn on flight tracking, you can check the price history since that date at any time. Image courtesy of Google Flights. 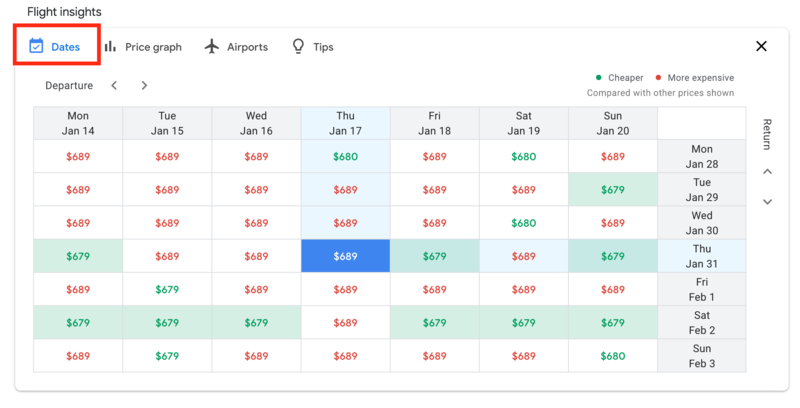 You can access any flight price alert you set by clicking on the 3-line menu icon in the upper-left corner of Google Flights and clicking “Tracked Flights.” You can also see a graph with price changes from the day you set the price alert going forward. An email alert from Google when my flight’s cost increased. Google also has an option to share your chosen itinerary before actually booking it. This is helpful if you’re looking up flights for someone else to book, or if you’re trying to make plans to travel with someone else. You’ll find the sharing buttons right under the price tracker button. You can either email the itinerary to yourself to save for later or share it with someone else. To send it to yourself, click the button on the left. Just like with the price tracker, if you’re logged into Google it’s sent to your Gmail; otherwise, enter your email address. To share with someone else, click the button on the right. A window pops up with options to get a link to copy and paste, enter an email address, or share via social media platforms like Twitter, Facebook, or Google+. Bottom Line: Google Flights is arguably the most effective way to search for flights, and it has powerful tools to help you find exactly what you’re looking for. We’ve just discussed how to utilize the newest layout of Google Flights which is still in beta testing. If you want to use the popular Discover Destinations function, you’ll need to start from the older version of the Google Flights homepage. For now, this is the default when you visit Google Flights. When you go to the homepage, before you start entering destinations and dates, you might notice a map and popular destinations below the search boxes. This is a really interesting tool. Have you ever wanted to plan a trip, but weren’t really sure where to go? This might be the perfect way to find some travel inspiration! There are 3 main ways you can search: dates, places, and interests. 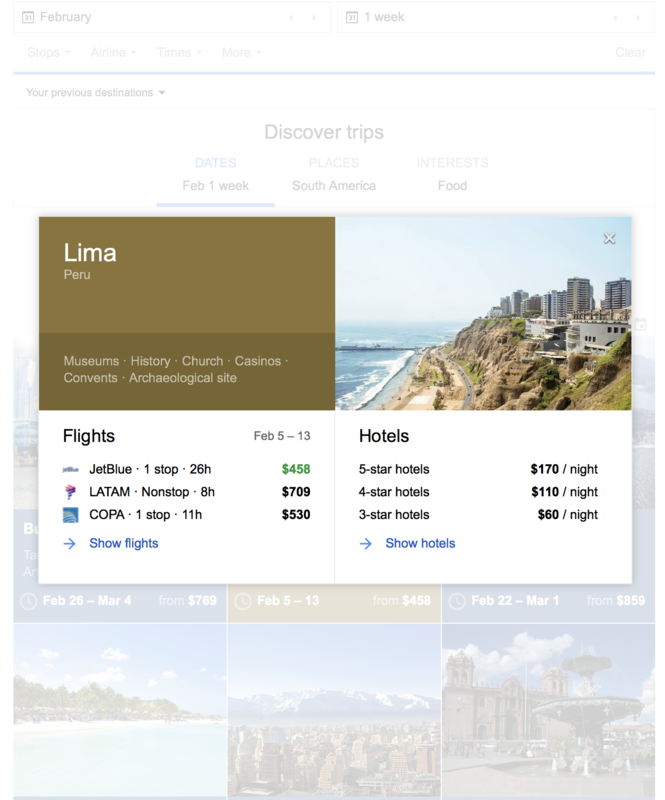 Scroll down on the Google Flights homepage to find the Discover Destinations tool. Image courtesy of Google Flights. 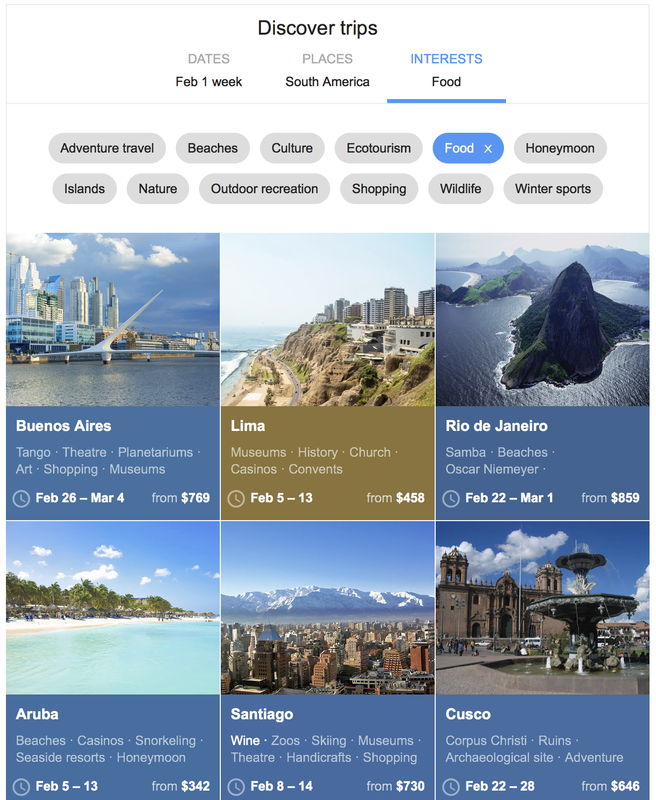 The Discover Destinations section has a few search options up top, with a bunch of “cards” underneath showing different locations, places, and prices. There’s also a map in the upper-left corner of the section with markers indicating different places you can go. As you enter search criteria, the cards change to reflect what you’ve entered so far. The first variable you can use to search is the dates. You can choose an upcoming month and trip length from the available buttons, or you can choose specific dates by either entering them up top in the flight search area (or by clicking the link that reads “Select specific dates” next to the month buttons). If you want to narrow down the cards a bit, click “Places” to switch the search field. This is meant to be fairly broad — after all, if you knew the exact city you wanted to fly to, you wouldn’t need to use the discovery tool! Buttons with continents appear by default, or you can use the search bar to find a region, country, or state. You can’t search by specific city, though (use the search tool for that instead). If you have a particular idea of what you want to do on the trip, try the “Interests” field by clicking the button. There’s no text box, but you can pick from a list of options. Choices include adventure travel, beaches, food, honeymoon, shopping, wildlife, and winter sports. The criteria: a 1-week trip in February to somewhere in South America known for good food. Image courtesy of Google Flights. If you don’t see something that piques your interest, keep playing around with the options, either selecting specific dates, different places, or different activities. Once you find something that appeals to you, click on that card. When you open a card, it expands to show more detail — in particular, it shows a few different activities, the top 3 flight options, and the general costs of hotels. Click the side of the card with flights to open the standard flight search screen with the dates and airports already entered. If you want, you can adjust your dates or change your departure airport. From here, the process to book, save, share, or track flights is the same as with a normal search. If you’re ready to book hotels, hit your browser’s “back” button to go back to the destination card, then click the section with hotels. There isn’t exactly a dedicated hotel equivalent of Google Flights — instead, you use regular search or Google Maps. Clicking the card brings you to a search page for hotels. 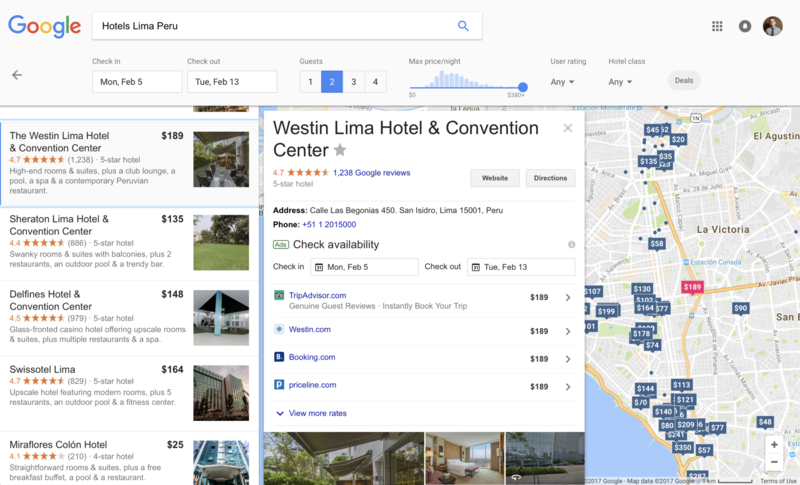 You can sort by relevance (which is based on Google’s search algorithms), price, or rating, and you can see each hotel’s location on the map. Make sure the dates listed at the top are correct; in my test searches, they often defaulted to different dates. Click on each result to see more information about the hotel, including where to book. Image courtesy of Google Flights. As you click on each hotel result — either in the list or on the map — a window pops up with a few more details and options for booking, including directly with the hotel or through OTAs. For activities, click each one to learn more — a new window opens with search results. For example, if I click “history” on the card in the above screenshot, the search terms will be “Lima Peru History.” I’ve found this tool to be a little too general, but it can still be a helpful way to find inspiration. I find the discover tool useful if I know I want to go on a trip and have a general idea of when I can take off, but I don’t know exactly where I want to go. In my experience, results have been more helpful when I’ve kept the search criteria more general — for example, picking a month and duration rather than specific dates. I also prefer to only pick activities or region; not both. That helps me find places or things to do that I otherwise might not have thought of. Hot Tip: You can find a lot of travel inspiration in the “Use Points” section of our site! Instead of entering search terms, another way to use the Discover Destinations tool is to browse a map. When you first go to the Google Flights home page and scroll to the tool, you’ll notice a map in the upper-left corner of the Discover cards. Click the map to explore destinations. Image courtesy of Google Flights. If you click the map card, a full-window map pops up with dots marking various places you could go. You can enter dates and a departure airport in the upper-left, and when you hover over the dots you’ll see the lowest available price for tickets. You can also use filters at the top to control number of stops, maximum price, airlines, duration, and interests. As you set these, the prices will change and the number of dots might decrease to match your criteria. For example, if you enter “winter sports” as an interest, most tropical or desert destinations will be eliminated. Once you pick a destination, a panel appears with specific flight options and hotels. Just like with the cards, click each section to make any necessary adjustments and book. If you’re looking for some inspiration, you can also try the “I’m Feeling Lucky” button. Just enter your dates and any other criteria, then press the button. Of the available destinations, Google picks one for you at random. If you don’t like it, you can always go back or click the button again. Bottom Line: The discovery tools built into Google Flights can help you find your next vacation spot! 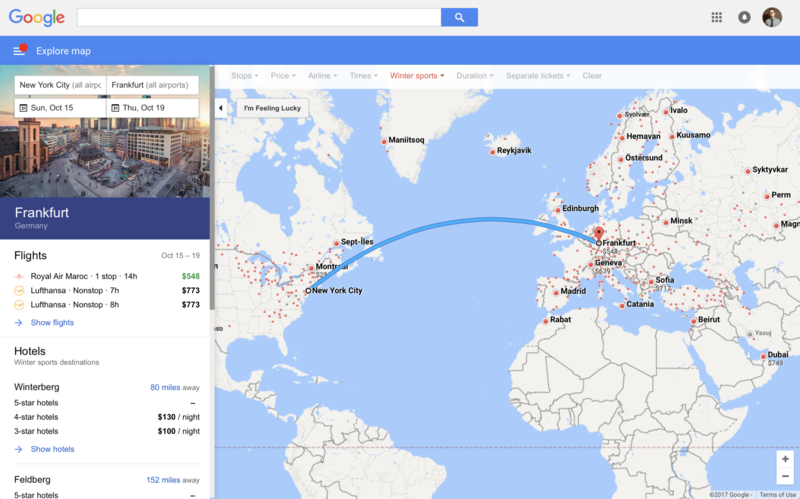 Google’s been improving the Flights tool since it launched in 2011 by making it faster, adding new functionalities, and adding airlines and options. Price tracking is just one of those newer features. 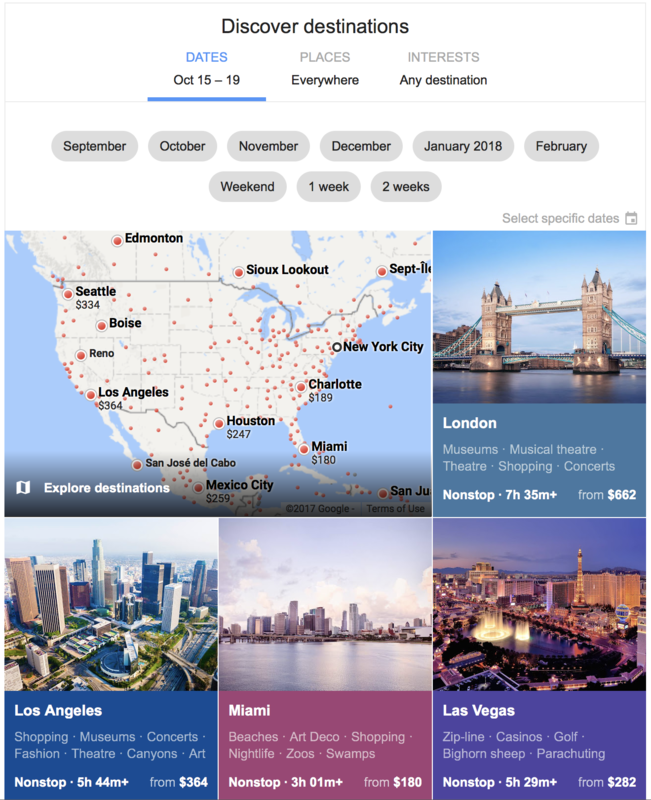 In October 2016, Google announced a new tool that would notify people looking for flights if prices were expected to change soon. Airline fare rules and planning are incredibly complicated and hard to figure out, so there’s no guarantee that Google’s prediction will be correct. However, in a few test cases I’ve found it to be fairly accurate. The tool only pops up if you’re looking for a flight that’s expected to change prices soon — you won’t see it otherwise. A red flag appears next to the “Best Flights” box or the specific flight and says when prices are expected to change. Better hurry up and book! Image courtesy of Google Flights. Click “Learn more” to see more information, including Google’s reasoning behind the prediction. It says when prices usually change, how often that happens, and by how much. Google Flights will not only now tell you of flights notifications and their reason, during search it will also predict delays to inform your purchase decision. Google Flights has added a flight results filter to show which options include access to an overhead bin for a carry-on bag. 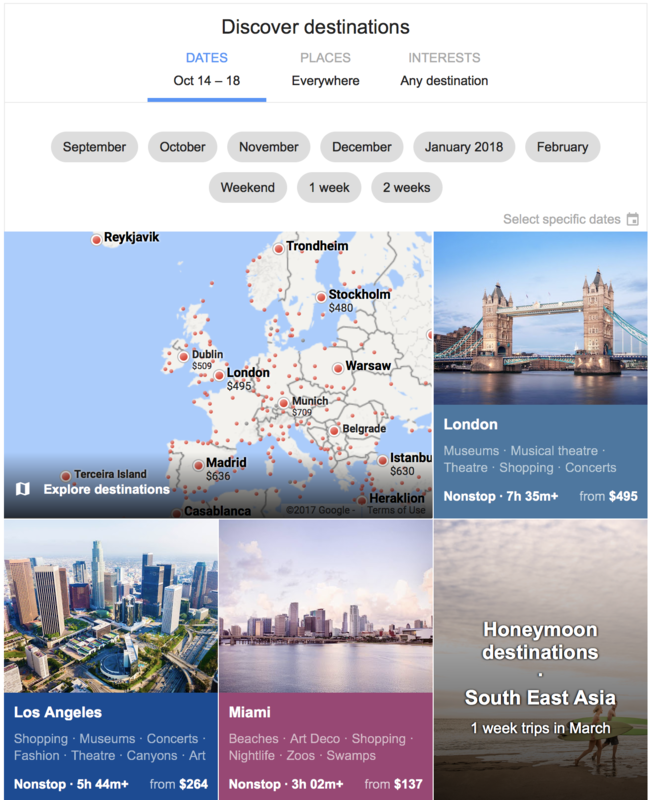 Earlier this year, a private developer launched a free extension for the Google Chrome web browser that adds information about seats to Google Flights search results. The Legroom browser extension is only available for Google Chrome. Image courtesy of Google Flights. When you search for an economy class ticket, you’ll see the particular flight’s pitch (distance from the back of one seat to the back of the next seat) on the right-hand side of each result. Flights with a smaller pitch are highlighted in red, while flights with a more generous pitch are in green. If you search for a premium cabin, you’ll see the type of seat on the flight — for example, a recliner, angled-flat, or lie-flat seat. This is a fantastically helpful tool! 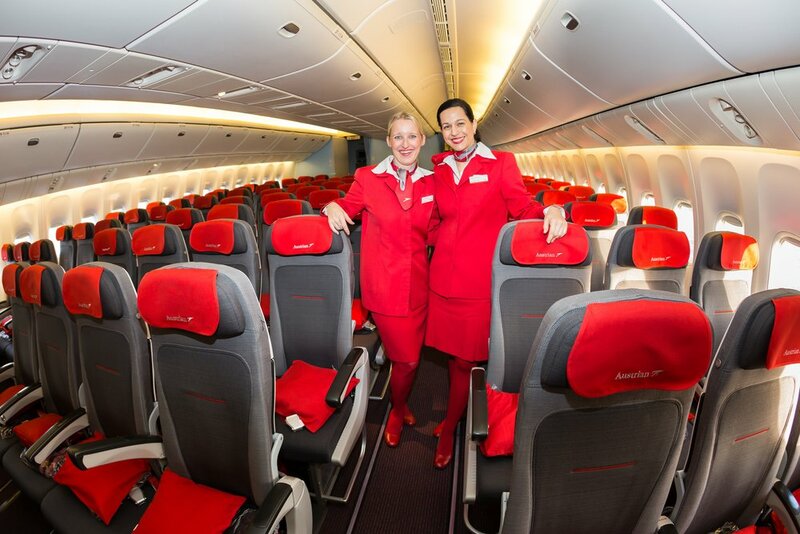 As airlines are still working to make their fleets uniform following mergers over the past few years, it’s helpful to know exactly what kind of seat you’re paying for, especially since it can vary based on which plane is being flown on the route. 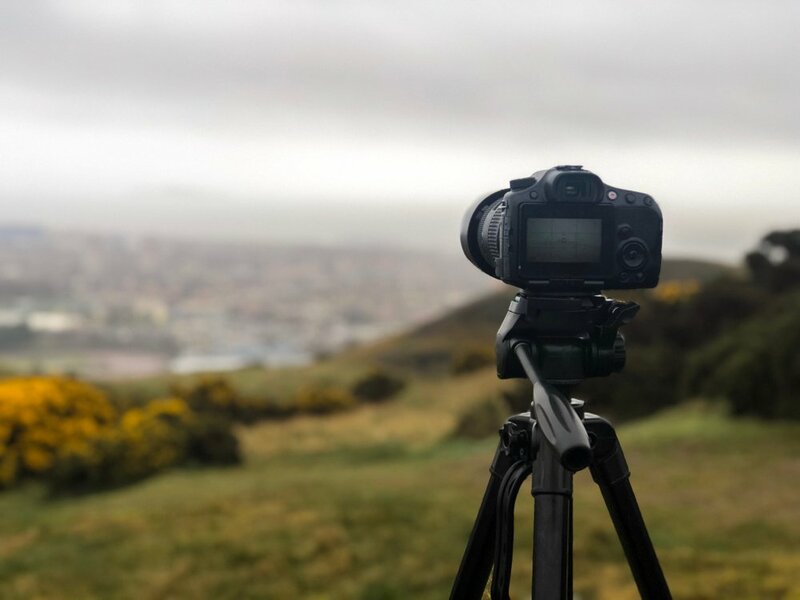 Bottom Line: New features continue to be brought into the software tool — whether officially through Google or through third parties. Google Flights is built on software that Google acquired when it bought ITA Software in 2011. 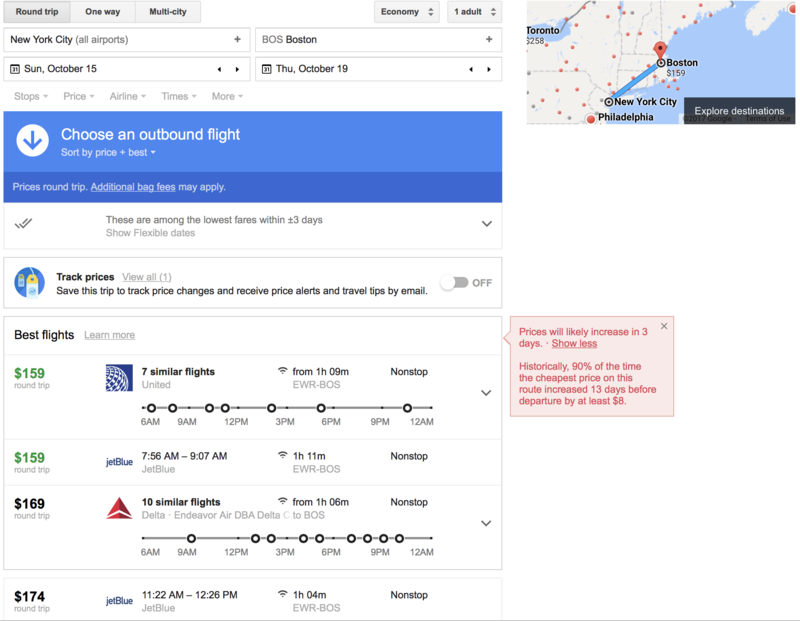 That software still powers Google Flights, and if you want basically complete control over your search — from routing and fare code to the tiniest detail — you can access this software’s advanced interface. ITA Matrix can be quite complicated, but the tradeoff is that you can search with much more control. If you’re interested in learning more, check out our complete guide to ITA Matrix. Google Flights is my first stop anytime I’m looking for flights. It includes most airlines, features great prices, and searches various online travel agencies and airline websites to save you the time. Even if I plan to book through an OTA, I always search GF first. There’s just one catch to be aware of: Google doesn’t have access to pricing for Southwest Airlines flights. Whenever Southwest operates a route, it’ll appear at the bottom of the flight search results, but you’ll have to click it to visit Southwest’s site and see the price for yourself. For additional information on other OTAs and Metasearch Engines, you can check out our post on the Best Websites For Booking Flights at The Cheapest Prices. Although the tool lets you search for, compare, and purchase flights, it’s not an online travel agency like Orbitz or Priceline. Rather, it’s a highly effective metasearch engine that saves you the step of searching each airline and website individually. You can compare routes, prices, times, airlines, and more to find the cheapest, most convenient, or preferred flight between any airports. The software tool works by searching databases from each airline and online travel agency to find flight schedules, seats, and prices. Behind the scenes, it works by using a program called ITA Matrix, which was originally developed for travel agents and reservation managers. Can you book through Google Flights? Not exactly as the tool itself is just a search engine. That means that unlike a travel agency, it’s not the one selling you the flight. However, Google includes links with each result to the cheapest available place to book — usually directly with the airline, but sometimes through an online travel agency or one of the airline’s partners. That said, there are 2 recent exceptions: you can book tickets on Lufthansa or Virgin America directly through Google Flights. How reliable is Google Flights? In theory, any service or search engine can make mistakes. However, the tool gets its information directly from the airlines. That means that if there’s a mistake or something incorrect, that’s because the airline did something wrong. 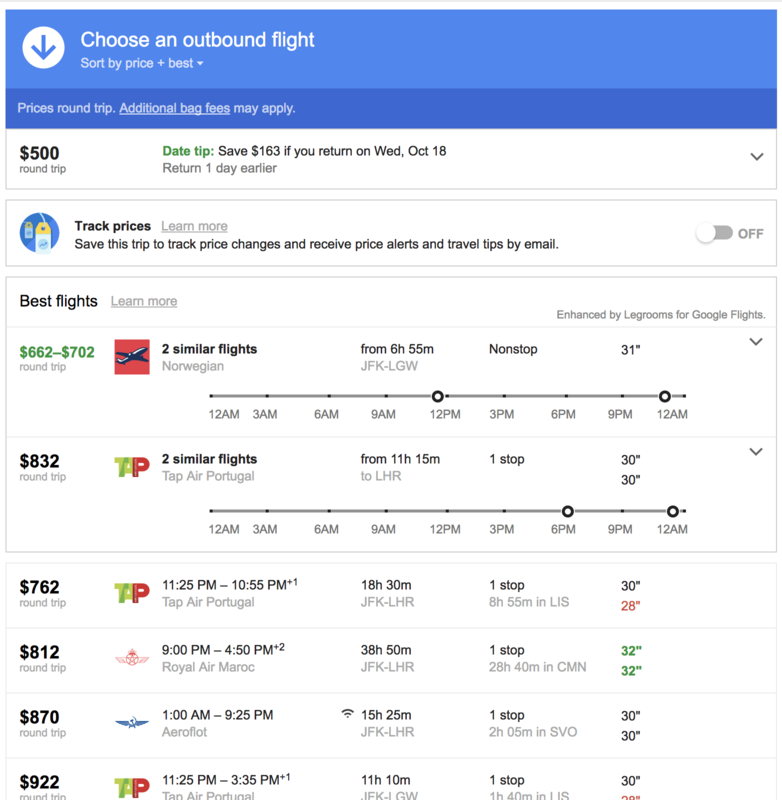 Are Google Flights reservations refundable? Because you’re not booking directly through Google, you should be sure to check the policy of whichever website you purchase your airfare from, as well as any restrictions with the particular fare you’ve bought. What currency is used for overseas flights purchased from US browser location? For example, you want to book a flight from Sydney to Cairns, Australia — do you see prices in US dollars, or Australian dollars? I’m pretty sure you can pay in either US or Aussie $’s, my preference would be to pay in USD. I called the airlines and was told that I must make the change with my travel agent, that I cannot do it directly with them. In this case, it is Google Flights as my ticket was bought using their service as a travel agency. But I can not find any way to contact Google Flights to change my reservation. Do you have any suggestion please? Hi Ines – Google Flights does not directly book any fares. This is likely why you can’t find a phone number to call and address your booking. Google Flights is a big metasearch engine which means it aggregates tons of information to give you all of the options you’re looking for. When you select your desired flights and are given a price, Google Flights then directs you either to the airline itself, or an OTA (online travel agency) that is advertising said fare. Google Flights has made this a pretty seamless process, so it’s likely you were redirected to an OTA and didn’t quite pick up on that. It happens to a lot of people! We suggest taking another look at your official confirmation e-mail for your flights, then contacting the OTA which sent you the e-mail. What has happened to https://www.google.com/flights/explore ? I am not seeing it as of today June 8. I would use this tool to judge places to go in a region and the best time to go. I hope google did not end that page. Are you still able to access the old interface. I tried your link and it sent me to the new site. 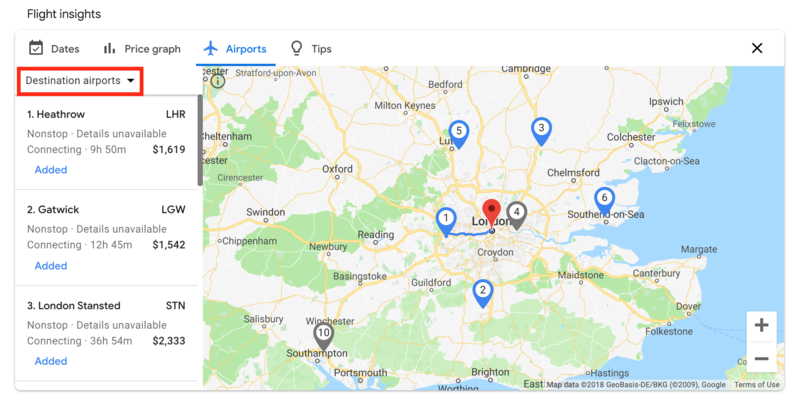 Hunter, the map with prices can be accessed on the new interface by clicking on the menu which is represented by three short horizontal lines in the upper left-hand corner next to “Google Flights” in the blue bar at the top of the page. The three options you should see are: Search Flights, Explore Map, and Tracked Prices. Hope this helps. As soon as you select Explore Map, the destination airport disappears. If you enter a destination on map view, the map disappears. Ashamed to confess I have never used Google Flights before. Having read this post, I’ve immediately tried out this tool myself. And here you go—Naples, France will be my first destination chosen with Google Flights. Thanks for a great insight. Strange error in pricing: I’ve been monitoring a multi-city flight from LAX to Abu Dhabi, via Istanbul on Turkish, one way, then Cairo to LAX, via Istanbul on the return. Google Flights says it’s $6371 on business class, but when I click on the price it then says “from $4971” – it sends me to Turkish airlines with several other options, but the one I wanted on their site is $4971. Not sure why G. Flights is giving me $6371. I loved the feature of just typing two cities or airport codes in the search bar and get connections between the two cities with schedule. Somehow it doesn’t work since a couple of days…. I used to type in the Google search bar two airport codes or even two cities sometimes and I would get the timetable of the nonstop and other connections. I loved it because I could quickly see what nonstop existed and what airlines would otherwise fly the quickest, although you wouldn’t see anything else. This feature was tremendously useful. Since about three weeks it doesn’t work and instead I get the prices directly. But I don’t want that. Thanks for your comment, Paul. I’ve actually had the occasion to need this lately and just used the non-stop filter to give me the flights I wanted to see but unfortunately no actual timetables. We prefer to have Sri Lankan rupee LKR in your currency list. otherwise, we have to open a separate google currency convert window and needs to check each time to calculate our cost and that is a pain. Hi Saman, please note that we are not Google or Google Flights, so we cannot address this request. We are Upgraded Points, a points & miles based website who publishes information related to points, miles, credit cards, travel, etc. I’m trying to book a ticket for my son to return from Portugal. Google flights tells me there’s a flight through Air Europa for $464 and to call the airline to book. When I call the airline, the price with them (and on their website) is >$3,000, not a small difference. I understand that Google Flights is a search tool but in this case, I’m curious where they’re getting the price from that it’s so vastly different. Thanks for the review. It is very complete and extensive and perfectly summarizes the pros and cons of using the app. I use Google Flights frequently. The fare for my date selected used to appear in U S dollars now it is in Mexican pesos. I prefer the US dollars. How can I change from pesos to U S dollars? Hi Walter. That’s a great question because I’m sure others have experienced the same. In the upper left hand corner of the Google Flights page you’ll see 3 straight bars next to “Google Flights”. This is a menu. When you click on the 3 bars menu, you will see “Search flights,Explore map,Tracked prices,Change language,Change country,and Change currency. You can change the currency there. Hope this helps. I’ve always used Google Flights for my International Travel. Most airlines’ booking sites are so complicated, it is almost impossible to use for what I want. Google flights can filter anything for you as the article has said. Then once directed to the airline website, it is purchase time. Hey Korbel – thank you for the comment and yes, we’re big fans of Google Flights too! I’m considering a two-leg flight I found on Google Flights that shows Condor as the airline for the first leg and Lufthansa for the second. When I finish selecting the flights and go to book it, it shows me paying the full amount specifically to Condor. Can anyone shed light on how the booking process is supposed to work for trips using multiple airlines? Should I be paying just part of it to Condor, and then the rest separately to Lufthansa? Thanks. Thanks so much for the quick reply and clear explanation, Christine. I really appreciate it. My pleasure, Robert. Thanks for visiting and for your comment.